As an Australian citizen (dual-nationality with my British citizenship), I am very pleased to see that their best-selling national newspaper, The Australian has reviewed my book Into The Arena: The World Of The Spanish Bullfight in this weekend’s edition (online here: Death in the afternoon revisited by a beginner bullfighter | The …). While Fiske-Harrison eventually dismisses his qualms, it is difficult to read his final chapter, “La escotada” – the thrust of the matador’s sword – without getting a sense that his year with the bulls has only deepened their mystery. It certainly hasn’t put an end to his concerns. Or, one suspects, his searching for an answer. I should add here, just to clarify, that despite press reports to the contrary, my talk at Blackwell’s Bookstore in Oxford has not been ‘threatened’ as such, and neither have I with regards to the talk. This was a miscommunication somewhere in the chain, as was the in-hindsight preposterous idea that the Thames Valley Police were aware of this and had failed to act. Anyway, I will be talking at Blackwell’s at 7pm on Thursday, February 9th. The photo of my one and only “bullfight” is enclosed below (Photo: Andy Cooke). 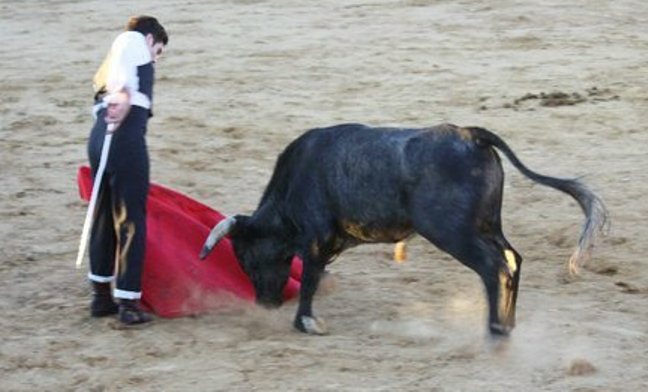 A full discussion of the ethics – or lack of – in bullfighting is the next post in this blog.